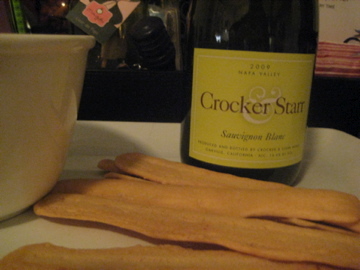 Don’t drink Crocker & Starr Sauvignon Blanc (2009) while eating Gruyere cheese. This pairing is a classic example of a delicious food ruining a delicious wine. Last week I opened a bottle of C&S, sent to me by DoSB and lauded as one of the best he’d tasted during a recent wine tour. I was shocked to find it bitter and flat. I was pained- did I store it incorrectly? Did something happen in transit? Did I forget to wash the soap out of my wine glass after its last use? Fortunately, I was drinking it with a friend, who immediately started raving. She knows a bit about wine, so it seemed something must be wrong on my end. After a little sleuthing, I realized the culprit was the freshly cut, earthy, pungent, and utterly wrong Gruyere I was snacking on. Once I’d cleansed my palate with grapes and crackers, I was relieved to find the Crocker and Starr full of the fresh, citrusy notes I had been promised. I wouldn’t go quite as far as “peaches and cream,” but the aroma is a little beachy, and the pear shone through. Phew.